Walking from Bev Sykes on Vimeo. Kindles are all the rage these days. A Kindle is a machine that lets you read books, magazines and newspapers. It will hold over 1,500 books. If you've read all your books and need another one instantly, you can download a book in seconds ($9.99 per book, unless otherwise indicated). You can also get your books read to you--if you're in the middle of a book and are going to be driving somewhere, it will play it for you (earphones optional; it doesn't say whether there is a way to have the sound come through your car speakers, but I'm sure there is--for an additional $30-$50). It also remembers the page you were last reading, so no hunting around for a bookmark. People who have Kindles absolutely love them. 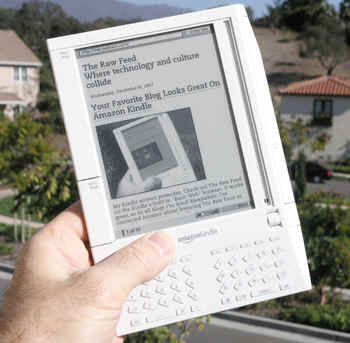 As a gadget geek, when Amazon first announced the Kindle, I was intrigued. How fun it would be. Lighter to carry around than a big book, if I were reading a thick book. But then I started thinking of all the reasons I like books, and the big reason (other than cost) why I should not even think about getting a Kindle. Books are more than just "something to read." Books are a whole sensual experience. 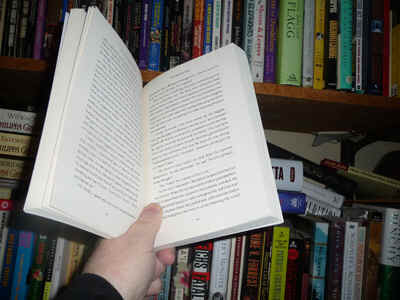 The heft of the book in your hand, the feel of the paper as you turn the pages, the smell of a musty old book store, the design of the page...the font chosen. It's all part of the reading experience. Then there is the fun of rummaging through someone's box of used books and finding just exactly the book you were looking for, or discovering a brand new author that your friend loved and you'd never read before. Kindle seems to be another step in the focus on "me" and away from "others." If I read a great book on a Kindle, I can't then give it to my mother and tell her she has to read this book. Books are not transferrable to other machines, apparently (which makes sense--Amazon is not in the business of charity). But there's an even bigger reason why I should never have a Kindle. Basically (and yes, I can see Peggy nodding her head), I'm a terrible klutz. I can't walk across the room without knocking something over. I remember once we were in a small store in Seattle and after the second or third time I'd nearly knocked something over, Peggy pointed at me and said "You. Outside." I waited outside while she completed her purchase. She rolled her eyes a lot when we were out shopping. If I had a kindle, I'd drop it, or sit on it, or lose it or knock it into a puddle of water, or let a puppy chew on it. I'm 100% convinced that would happen. Now I can see a lot of plusses to having a Kindle. Apparently you can read blogs on your kindle. That would be cool, to be able to read blogs while I'm away from the computer--I could keep up better. Also I think you can increase the print size, which might also be nice with some books. And I suspect that I could read in the car at night without disturbing the driver. That would be great. But the biggest deterrent to getting a kindle is the cost. $350 at Amazon. That's without books. Then for every book you want to read, add another $9. I'm sitting here with a stack of books staring at me, books I'm eager to read (I'm reading the Heriot now) and think that I'd have to have my head examined to even think about getting a Kindle before I've finished all the books I have on the book shelves throughout the house! I'm thinking of how many books I could buy for $350. If you have a Kindle (or even if you don't), I'd love to know your thoughts. Are Kindle-like machines the wave of the future? Or is this going to be a flash in the pan? Someone who wrote a comment on my status on Facebook said, "A house with no books is like a body with no soul." I wonder how that fits for a Kindle ..."
P.S. I saw a Kindle today. The friend with whom I had lunch had one. She had bought a leather cover for it ($30 more) and I have to admit that with a cover it seemed more like a real book and didn't seem quite as dislikable as I thought it would. However, it's not back-lit, so no reading in the dark, as I originally thought, unless you buy one of the optional clip on lights ($13 more) She also liked that she could send paperwork that she needed to read to her special address on Amazon and they would upload it to her Kindle (for 10 cents a page). All things considered, though I can see some positive features, the Kindle mostly seems like the gift that keeps on giving--to Amazon!